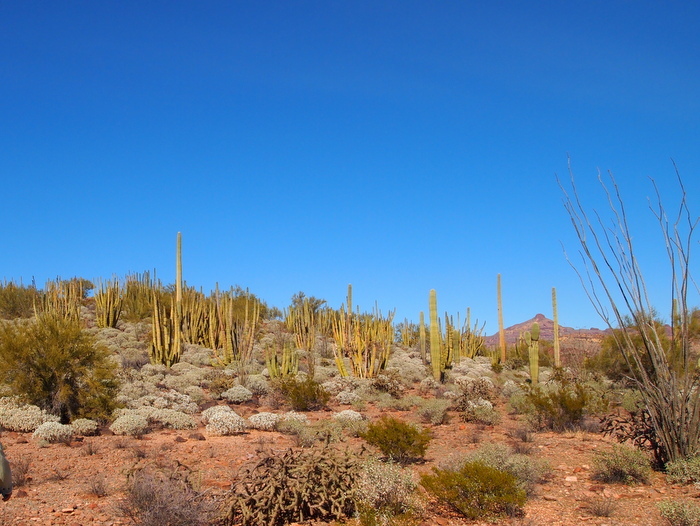 A short 30 mile drive from our camping spot in Ajo lies the Organ Pipe Cactus National Monument. This relatively small parcel of protected land on the border of Arizona and Mexico provides 516 square miles of sanctuary for a diverse array of plants and animals. A few days ago we spent a bright sunny afternoon exploring the park and all it has to offer. Our first stop was at the visitor center where we checked out the informative displays, found ourselves a sticker for the truck, and procured a map of the park from the friendly park ranger. Next up was the 20 mile Ajo Mountain Drive Loop. It it one of those awesome national park roads where they give you a guide book and the numbers in the book corresponds with the numbers on the road. The reading nerd in me loves these kinds of roads! Every number has a pull-off where you can get out and explore. 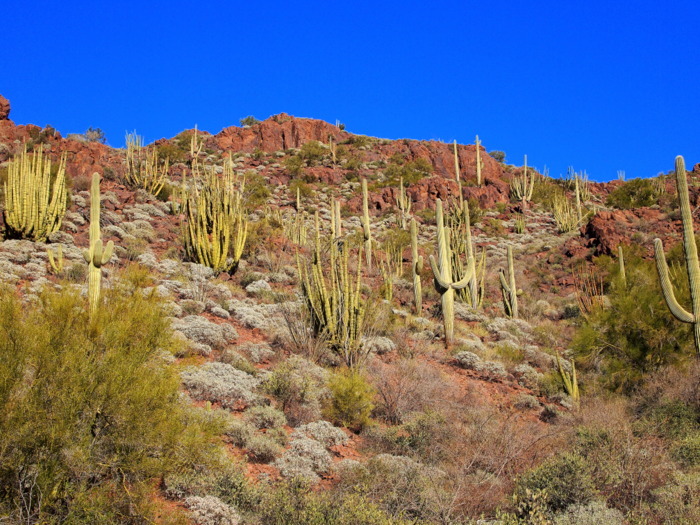 The first one we stopped at was number four near a hillside filled with Organ Pipe Cati. 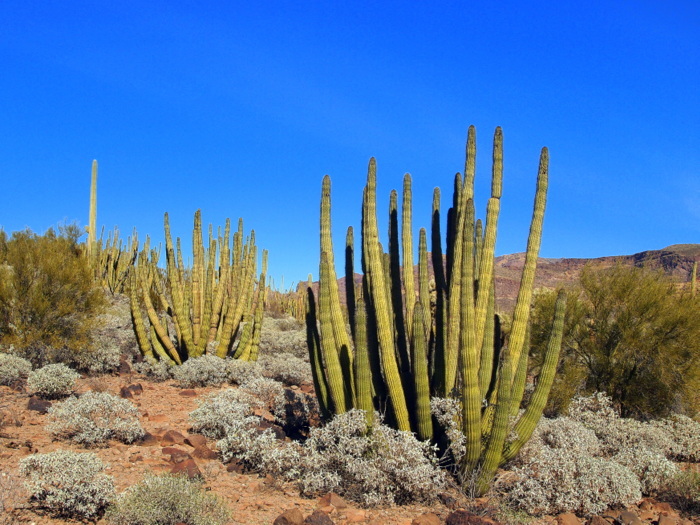 We learned from the guide book that Organ Pipe Cactus like lots of warmth and for this reason are most often found on south facing slopes. 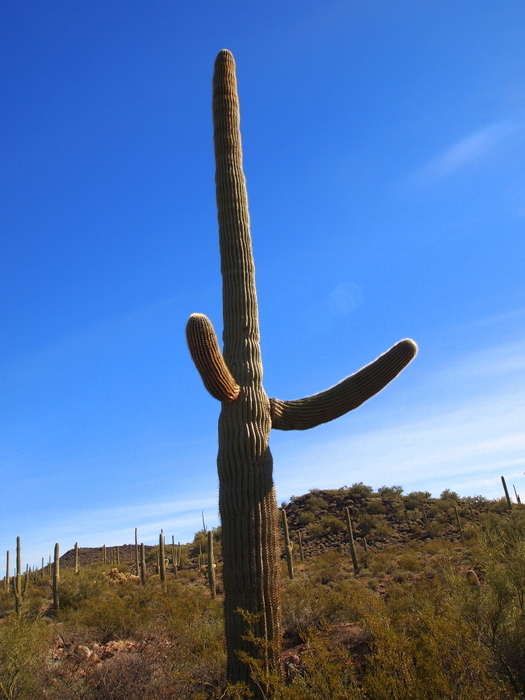 This is also why the Organ Pipe is only found in the very southern parts of the Sonoran desert where the temperatures remain consistently warm. Mixed in with the many, many Organ Pipes were tons of majestic Saguaro Cacti. We are constantly in awe of these giant wonders of the desert. It’s amazing how no two look the same. Look- this one wants to give you a hug! 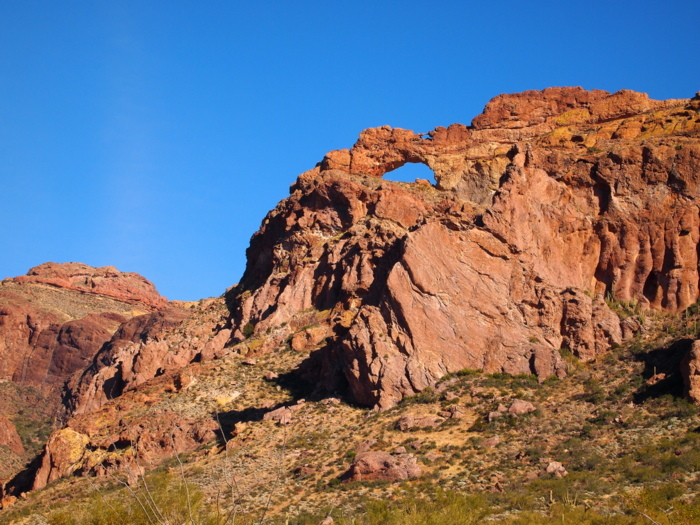 The ranger told us that one of the must sees along the road was the Crested Organ Pipe at stop number nine. 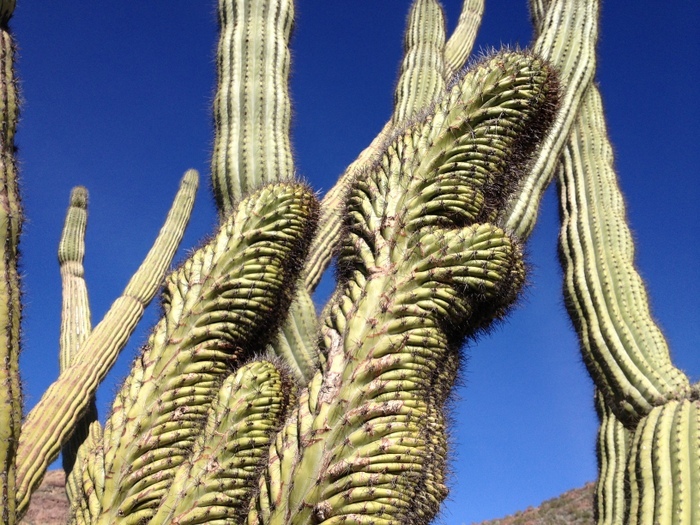 A crested cactus is one that has a strange formation twisted into a “crest”- like shape. No one is exactly sure why these formations occur, but they are fairly rare which makes spotting a crested cactus somewhat exciting. As you can see this cactus was especially large which made it impressive even without the funky growth in the middle. Next up was a stop at the Arch Canyon trailhead. We had Phin in the car with us (and he’s not allowed on the trails) so we didn’t take the hike, but we did enjoy a view of the arches in the mountains above. The road ended with a drive through a forest of Cholla cactus. We first spotted these deceivingly soft-looking cacti back in the Joshua Tree National Park. 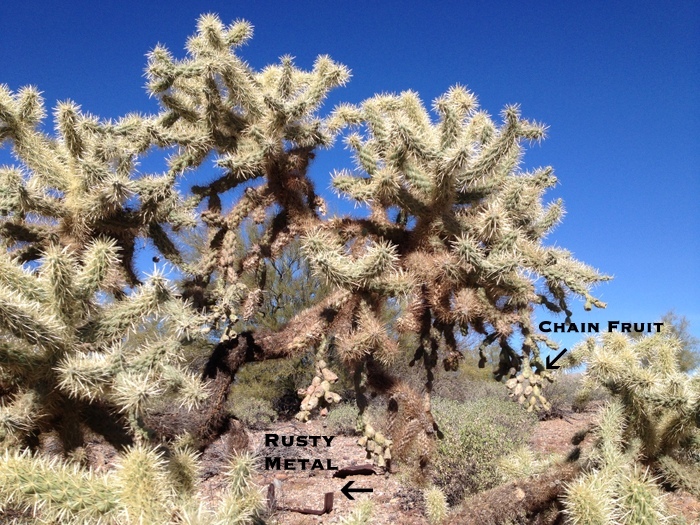 This time the Teddy Bear Cholla that we saw in Joshua Tree were mixed in with Chain-Fruit Cholla. They are larger than their Teddy Bear relatives and have a fruit that hangs down off the branches in a chain formation. We didn’t stop to take any pictures so this morning I went in search of some Chain-Fruit Cholla that I had spotted nearby. I found one and took a picture for you. I was going to try and pass is off as one in the national park, but then I noticed the piece of rusty trash in the background. Yup, that’s how you can tell it’s from around here- this place it littered with rusty metal and broken glass. Kind of sad. 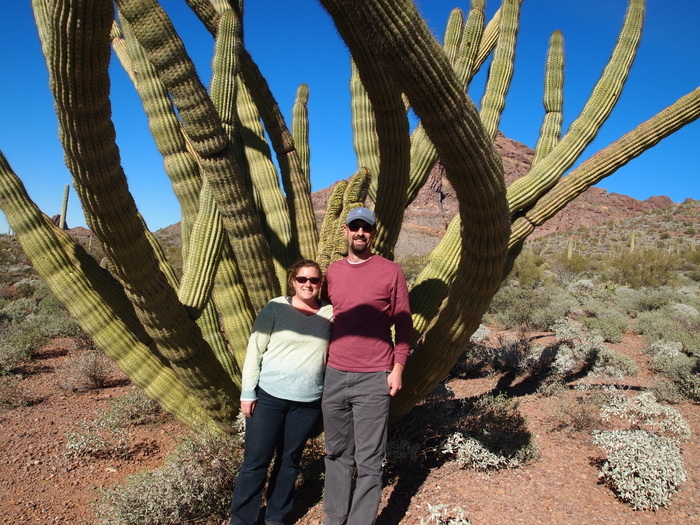 We had a great visit to the Organ Pipe National Monument. It was a nice opportunity to learn a bit more about the history and plant life of the beautiful Sonoran Desert that surrounds us. Great post, very informative as always!